Hola foodies! What’s cooking in your kitchen? The theme for this week is very special and interesting too as the whole week I will be sharing stories with you on my favorite topic “food” and some very interesting and easy to make recipes along with it. Moving on, let’s go back to the past and get a glimpse of the best Banoffee pie I ever had. 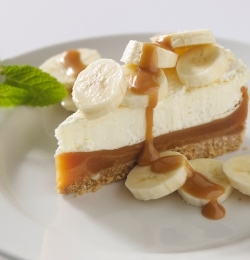 For those who don’t know what a Banoffee pie is, it is a pie made with bananas and toffee and because of this it is called Banoffee pie. About four months ago me and my gang of girls went to this famous place called Rico’s (if you are a Delhi University student, then you definitely know which place I am talking about) after waiting for about forty-five minutes we were blesses with a table and we grabbed our seats. Everything we ordered that day was just awesome, be it the very berry smoothie or the heart shaped pizza (valentines madness). But the star of the day was the banoffee pie. I still think of it solely with temptation to eat it. The crunch of the base and softness of the toffee layered with caramelized bananas gave me the best feeling of my life, I know the description made you drool. The forty-five minutes wait was worth the pie! If you are in Delhi then you should surely visit Rico’s in GTB Nagar near Delhi University. So goodbye and remember food is to be loved not to be chewed!